Ever Wondered Why you get a Sudden message in the status bar on Google Chrome saying “Rats! WebGL hit a snag”? This Error Message is due to WebGL. So first let us get to know about WebGL. The Group popularly known as the “Khronos Group designs and maintains WebGL, and it is a non-profit group, situated in Beaverton, Oregon (USA). WebGL acts as a thin sheet of cloth around OpenGL which is a used for drawing 2D graphics (Low-Level Library). It helps in pushing data to the GPU, and execution of the specialized code on the GPU itself. WebGL is the easy and best way to bring 3D graphics and also 2D everywhere. Once written, it can run Everywhere. WebGL apart from used in 3D wed design and gaming, it also has amazed scientists for research and scientific works.A book named “Cellular Automata” have used this technology to simulate Debris flow. Did you know? NASA, Yes “NASA” developed an interactive web application called experience curiosity to celebrate the 3rd anniversary of the famous Curiosity rover landing on Mars. Sometimes when using WebGL we have an error about site crashing and telling us that WebGL is not supported. You will come across an error message saying “Rats! WebGL hit a snag” while surfing on Chrome browser. Even if we try to Reload the web page or try to go to another one, the message reappears. 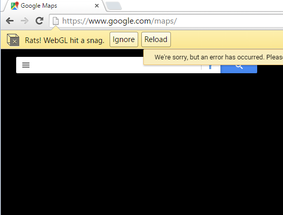 In fact, we get an error message every time browser try to access WebGL. Note: – This error message does not indicate continuous errors but appears whenever someone is trying to make constant attempts to use WebGL. We can fix this problem by disabling hardware accelerated graphics from the settings in google chrome. Follow the steps mentioned below. Navigate to chrome://settings>>show advanced settings. There you can see an option “use hardware acceleration when available”. Uncheck it and Restart your browser to make the changes live. Go to chrome://flags. Search for the option “Disable WebGL. Enable this option and restart your browser. It is very unlikely that your problem still Persist But if you encounter this error then there is another way to tackle it. Here under the Problems detected heading, Check for any unusual red warnings, as I have shown in the picture below. By this, you can figure out what the problem is, and what exactly is making that error message pop. But as I said earlier Fix 1 & 2 would work for you like a Charm.